Sven Birkerts views “double vantage point” as genre’s signature. What’s the difference between a novel and a memoir? The question isn’t as dumb as it may appear. A novel can be autobiographical, drawn completely from life remembered; a memoir is of course made of memory shaped and dramatized. Both forms are completely subjective, that’s their point, and draw upon memory, which is by nature imaginative. This manipulation of the double vantage point is the memoirist’s single most powerful and adaptable technique, allowing for a complex temporal access. The writer deploys the time frame as needed—sparingly, as we will see in certain works—in order to achieve greater immersion in a particular period (generally the more distant past); or else, in some cases, with more regular alternation. The purpose decides the process. To stay in one vantage point is to foreground the fictional illusionism; to play the hindsight perspective against it is to undercut the illusionism by emphasizing the revision of perspectives and the incorporation of relativism. The later counteracts the coma-inducing logic of, “If I just tell what happened . . .” and promotes the dramatizing of the process of realization, which is the real point. Birkerts focuses on reflection—how the writer now sees the past. 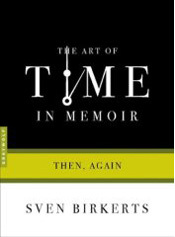 The Art of Time in Memoir addresses types of memoirs, including: lyrical (evocations of a paradise lost, usually in childhood); coming-of-age sagas; tales of fathers and sons (invariably by sons coping with distant, damaged, or absent fathers); books by daughters about mothers (usually overly dominating ones); and accounts of trauma. He discusses two or three books in depth in each category. I put down The Art of Time in Memoir twice to read acclaimed memoirs it discusses. Richard Hoffman’s 1995 Half the House is about the death of his two brothers from muscular dystrophy, his molestation by a coach, and his father’s complicit silence. Hoffman, a poet, tells a distressing story that achieves an equally compelling second act when he confronts, as a suffering adult, his father, who is by then ailing and widowed. Maureen Howard’s 1978 Facts of Life, which won a National Book Critics Circle award, is about her Irish Catholic parents and milieu. I found Howard’s view of her parents horribly depressing—they are just so sad, in her skillful rendering—but her nontraditional approach was interesting, and I’m now reading with enjoyment her portrait of Audubon’s lonely wife in her novel Big as Life. Virginia Woolf’s “A Sketch of the Past”: a model of retrospection. We note, too, Woolf’s archly reflective aside—“it is more convenient artistically to suppose that we were going to St. Ives, for that will lead to my other memory”—which reminds us, lest we ever forget, that a memoir is, whatever its pretenses to the contrary, a narrative conceit; it creates a structure that is the life shaped and disciplined to serve the pattern, the hindsight recognition that is deemed to be the larger, more important truth. Woolf is, in those phrases, asserting her artistic license, even as she is en route to netting all of those early perceptions in their concrete . . . particularity. It’s interesting that Birkert’s own memoir, My Sky Blue Trades, doesn’t fit into any of the categories he discusses. It’s a fine memoir, though somewhat disjointed–Birkerts writes about his Latvian parents and growing up in Michigan, then switches to time spent working in the very first bookstore owned by the Borders brothers. He spends much of the memoir writing about love. The book is well-written, though very different in tone from his more formal nonfiction. What do you think of the categories Birkerts chooses? His categories seemed okay to me, but categories always can feel arbitrary. He calls Dillard’s An American Childhood a lyric, which is interesting, but it could also be a coming of age story–a happy one–and he said himself that Karr’s could have been in the mothers-daughters slot but her mother’s mental illness kicked it into trauma. This sounds like a fascinating book. Thanks so much for such a thoughtful review. I just bought this one, and I’m looking forward to reading. I’ve enjoyed catching up with your posts, Richard. Thanks, Cynthia. I appreciate your comments.